18V BATTERY OPERATED CUTTING TOOL (Battery: 18 V (4Ah), Capacity: 2-9/16" Cu/Al, Charger: 120 VAC, Item Weight: 14.1 lbs.) 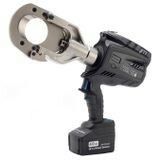 | Tallman Equipment Co., Inc.
Next generation of 18.0 V cordless hydraulic cutting tool Specifically designed to cut copper, aluminum and telecommunication cables having a max overall diameter of 2-9/16”.The blades are manufactured from high strength special Steel, heat treated to ensure a long service life. New Li-Ion 18 V 4 Ah batteries offer a higher capacity than 14.4 V 3 Ah, while greater cutting speed and cutting force result from a revitalized hydraulic system with double speed action. The battery is equipped with led indicators that indicate the remaining battery life at any time by pressing the adjacent button. The head can rotate through 335 degrees, to enable the operator to work in the most comfortable position, and can easily be opened to allow cutting of running cables. Fitted with a maximum hydraulic pressure valve. Designed with improved balance, B-TC650A is easily manageable during the cutting process and, by the use of bi-component plastics, has a shell with high resistance to wear and damage. Rubber grip inserts, low noise and minimal vibration aid operator comfort while additional convenience and safety are provided by LED lighting of the working area. 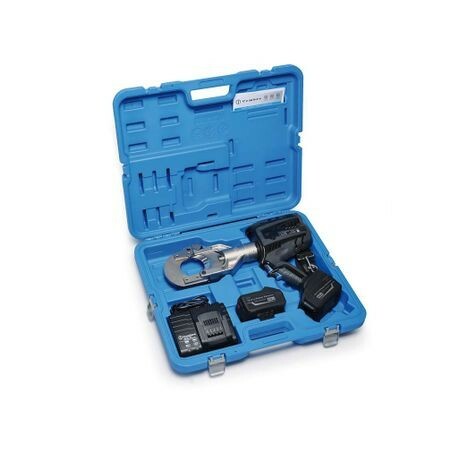 Kit includes: Tool, (2) 18 V Lithium-ion batteries, strap, AC charger, and case.